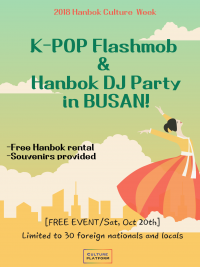 K-POP Flashmob + Hanbok DJ Party in BUSAN! in the morning to learn and to practice the choreography of one of the Bigbang’s songs ‘Red Sunset’. and had absolutely nailed it! Six of the participants even had a chance to be on stage as foreign Hanbok models. to our first event being ending with tremendous success! 진행하였습니다. 10개국에서 온 20명의 외국인 친구들이 본 이벤트에 참여하여 자리를 빛내주었습니다. 참가자 한분한분께 감사의 말씀을 전합니다.